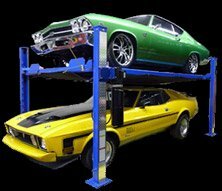 What could be better than a top-quality lift for your home garage? How about a few top-quality accessories to go with it? You’ll only be making the best investment in your home vehicle maintenance or storage if you’re fully equipped and prepared. We’ve got a few ideas for you. The first thing to consider when deciding on how to accessorize and enhance your lift is what kinds of vehicles it will be lifting. There is also the issue of space to bear in mind. 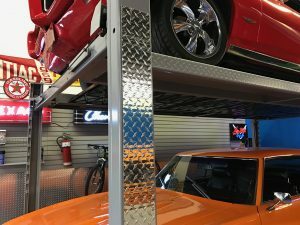 If your garage offers you a good amount of clearance and you want to give your lift an extra degree of flexibility in terms of what it can do, a set of height extensions would be a great idea. You might also see them referred to as adapters. They’re ideal for allowing you to store or work on vehicles whose frame and rocker panel are separated by a bit of extra distance, such as trucks or vans. Standard two or four-door cars aren’t the only things that need lifting! Some accessories are functional in nature, while others are a bit more stylistic. Certain aluminum accessories fall into both categories, depending on which ones you choose. If you want to take the look of your home lift to a more flashy and industry-grade level, upgrading its posts to shiny diamond plate aluminum is the way to go. Meanwhile, in addition to lift extensions, one excellent way of expanding the versatility of a residential 4-post lift is to get a few diamond plate aluminum inserts. They can handle a significant amount of weight while adapting your lift to accommodate vehicles like quads and bikes. Of course, accessorizing shouldn’t be exclusively oriented towards your lift itself. As a true automotive fanatic, your garage is something of a sacred space. The better it looks and feels, the more engaged in your DIY maintenance you’ll be. Even if you’re just looking for a lift to optimize your parking at home, there’s nothing better than turning a basic storage space into a car lover’s sanctuary. Neon signs, for instance, have a pretty classic feel, and even more so when they’re themed after classic cars. If you’re going to upgrade your lift, you should give the interior of your garage the same treatment! Are you fully geared up to create the ultimate home garage? Whether you own one car or you’ve got a collection going, every vehicle deserves the best, and you deserve a space that is built for a true car lover. Check out our accessories page to get the details on what we have! Do You Need a Classic Car Collection to Own a Lift? Why Not Just Use Jack Stands Instead of a Lift?